Perfect for football parties and other get-togethers, this crack dip is made in the crockpot and so delicious! Place the cream cheese, sour cream, cheddar cheese, bacon and 1/2 packet of ranch mix into a small slow cooker. Cover and cook on LOW for 2-3 hours, or until hot and bubbly. Stir to combine. Taste and add additional ranch seasoning if necessary. Serve with chips, crackers or veggies for dipping. Cooking times may vary with different slow cookers. Check and stir as necessary. 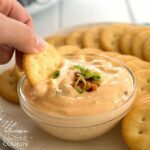 This recipe for Crockpot Crack Dip was printed from AmandasCookin.com - https://amandascookin.com/crockpot-crack-dip/ and can only be printed for education or personal use.